Welcome back. Here is your 5th free video. Number 6 will arrive tomorrow. What you will learn in this video is one of the main reasons why I originally became so interested in Thai Massage and ended up falling in love with it. The health benefits of yoga are well known, and yoga is being widely practiced all over the world nowadays. However in yoga you have to do the exercises yourself. How about yoga being done to you? This is what Thai Massage can do! It combines many benefits of massage and yoga. Restoration of joint movement to a fully functional state. And all this is happening while you are enjoying a wonderfully relaxing massage! 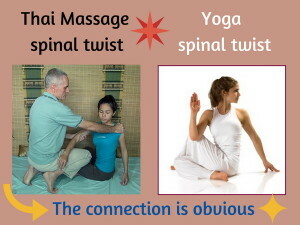 Enjoy the fifth module of your free introductory Thai Massage video course. If video does not play smoothly, pause it and let it load for a minute. If you want to keep the video, right click on the button and “save link as” or “save target as” to download. Did you like the video? Please leave a comment below! Hi I would like to know if I can use my iPad for the entire course or I have download into a computer. Sure you can use your iPad as long as you have at least 6 gigabytes of available storage on it. I am enjoying watching these videos.By watching you Shama i know i am doing these techniques correctly. i am looking forward to learning more. I am glad that you are enjoying the videos. You have a lot to look forward to when you will work with the full system. Thanks Sir for your efforts.Really like the neck strectng. I’m enjoying watching these videos.watch twice so far, going into practice know. love the cobra stretching I am looking forward to learning more. I was in THAILAND during 2nd week of April 2016, I had Full Body Oil Massage at Pattaya for more than 3 Hours, the service was so Perfect, I know little about Massage, I wanted to learn and Practice Some Basic in Massage, so I was searching on-line and came across your wonderful service, Hope I come to Chang Mai in July 2016 to Practice the Basic course directly. May your Service for Humanity and World Grow and Be for Ever. Hi Gyana, I am happy to hear that you had a great massage experience in Pattaya. And thanks for your kind words of appreciation! I liked the way you linked your fingers with the model’s and did a sort of rolling stretch of her hands and wrists. Also, I’ve been instinctively working feet first and head/scalp last over the past year. I’m not sure what clients think of it, they seem happy and no one has complained. As it’s the opposite of what I was taught in school I’ve been a little nervous I might be doing something possibly counterproductively, but of course I still do it because it feels right to me. It was really nice hearing you say you also like to start at the feet and end at the face/scalp area! I feel empowered already! thanks again to sent to me the video of Thai massage. I really wish to start one of your course but I am thinking which one. I like your hands thai massage .